The heat wave in Finland has got everyone searching for something to cool them down. Here's a few tips of best places to get cooling ice cream in Helsinki! Helsingin Jäätelötehdas is the oldest still operating ice cream manufacturer in Finland. The family business was founded in 1922 in Helsinki and is now in the third generation. They are known for making traditional creamy ice cream with giant scoops! You must be brave to eat your ice cream from the cone, we took the safe option and ate our ice cream from this huge cup. It was a good size to share with a friend. We recommend trying the lemon flavor! Find few of the Helsingin Jäätelötehdas Kiosks at the seaside of Kaivopuisto area, in the address Merisatamanranta 10, and on Ehrenströmintie by Kompassitori and Mattolaituri. The Sinisen Huvilan Kahvila is a popular Cafe because of its easy location and breath taking view. It's a short walk from the city center in the Töölönlahti area, which is popular as a jogging route and for easy strolls around the shore with the locals. Here you can find the classic Ingmann creamy ice cream as well as the Chjoko vegan ice creams which we tried this time (the oat and raspberry ice cream was amazing). In the cafe you can also find their own freshly baked goods, lunch, coffee and much more. Find Sinisen Huvilan Kahvila at the address Linnunlauluntie 11 H.
Jädelino is a new surprising ice cream manufacturer in Helsinki which was founded only a few years ago in 2013. 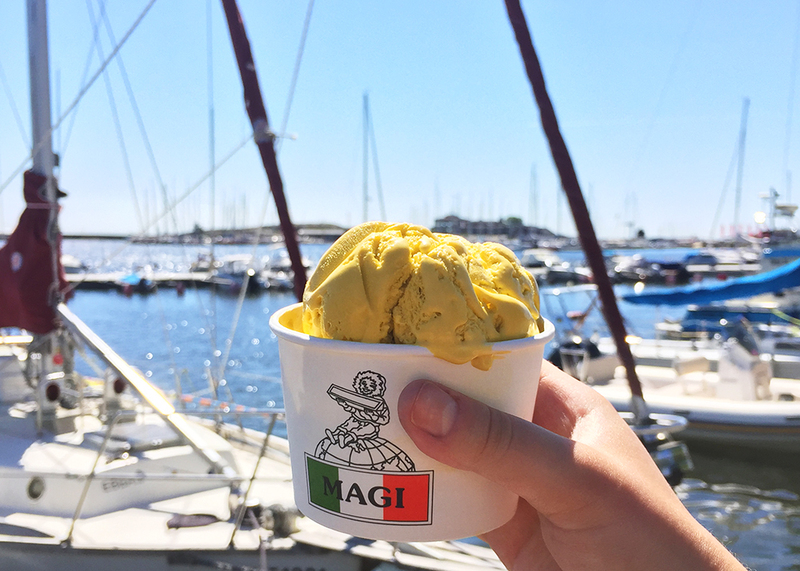 They have quickly become known for making their artisan ice creams in small batches in Helsinki and selling them freshly made. The Teurastamo area, where Jädelino is located is described as "The former Helsinki abattoir from 1933, re-opened in 2012 as Teurastamo Helsinki. It is a melting pot of food and urban culture.". So we recommend to take a look at the whole Teurastamo area, there's a lot more than just delicious ice cream! Find Jädelino Cafe at the Teurastamo area at the address Työpajankatu 2.